What is Tree Preservation & Protection? 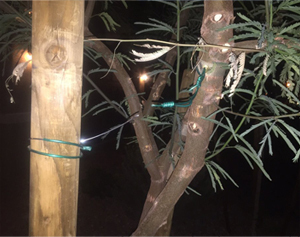 Tree protection and preservation is using preventative means to protect a tree when future damage is known to occur around the proximity of a tree. Usually, tree protection is completed on trees that are surrounding a construction or renovation site. See below for details. Root Pruning is generally completed with a wheel saw. This is a large wheel with very sharp teeth for a clean cut. The cuts are made just outside the drip line of a tree. Following the cut with the wheel saw, sharp hand snips are used to cut any excess & fibrous roots. Root pruning is a very important step in the tree protection process. A Tree protection fence is installed around the drip line of the tree just outside of where the root pruning took place. The fencing can be heavy silt fence to wire fabric fence depending on the specifications. It is usually installed within 4 inches of the root pruning. Orange florescent flags are placed on the fence with a tree protection fence sign posted. The fence is intended to keep heavy equipment, and traffic away from the tree. Tree pruning is a necessary and healthy tree care practice to keep a tree from diseased or dying limbs. Pruning the deadwood in a tree should be completed before doing the other tree protection tasks. Installing a mulch bed around the tree is another common and healthy tree care procedure. Mulch will avoid surface root damage, retain moisture for roots, and help protect a tree.